On Saturday, Electric Mobility Canada hosted the 3rd annual national drive electric week event in the Queen City. REGINA - Crowds in Regina were revved up with excitement for electric cars this weekend. "It's something that's going on around the world right now, this week," said James Dennis, electric car enthusiast and event organizer. "It's to help bring awareness to electric vehicles, not only for a form of transportation but also to help clean up the environment. This Volkswagon Beetle was redone to function as an electric vehicle. Dennis said a common misconception is electric cars are not functional during Saskatchewan winters. "The thing people need to understand is these are electric vehicles, and you [have to] charge them. They warm like a block heater so it's always thermally managed," he said. The average electric vehicle can run for 64 to 320 kilometres on one charge. 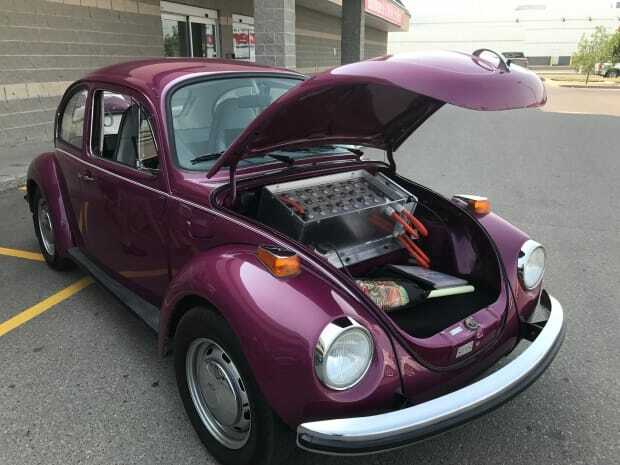 Vehicles on display included a 200 Tesla Roadster, Volkswagon Beetle and a seven-passenger Tesla Model S.
Organizers predicted record breaking attendance at this year's events held in the province.